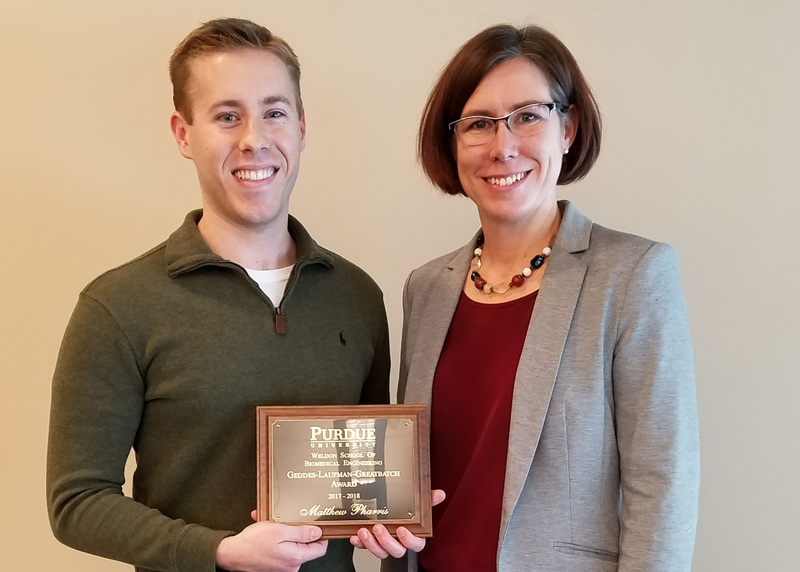 Matthew Pharris, a PhD candidate in the Purdue University Weldon School of Biomedical Engineering, is the recipient of the 2018 Geddes-Laufman-Greatbatch Award. The annual award is presented to the outstanding student or postdoctoral fellow in the Weldon School. Pharris received the award at the annual Biomedical Engineering Graduate Student Association Fall Potluck and Speaker Exchange on Nov. 27. Pharris joined the laboratory of Tamara Kinzer-Ursem, assistant professor of biomedical engineering, in 2015 after graduating from the Weldon School of Biomedical engineering undergraduate program. His research uses computational models to characterize the protein signaling mechanisms within neurons that may become dysregulated in neurological disorders such as Alzheimer’s disease. He was cited for his outstanding research, record of successful publications, presentations at the national level, passion for teaching, and mentorship of undergraduate students. The award was established by Dr. Leslie A. Geddes, the late Showalter Distinguished Professor Emeritus of Biomedical Engineering, after he received the 1987 Association for the Advancement of Medical Instrumentation (AAMI) Foundation's Laufman-Greatbatch Prize. The Laufman-Greatbatch Prize was first awarded in 1975 and named for Harold Laufman, MD and Wilson Greatbatch, PhD, two of the most renowned leaders and pioneers in the medical device field. The prize honors an individual or group that has made a significant, singular, and global impact on the advancement of patient care or patient safety through the development, enhancement, or creation of a specific medical device, instrument, or service. This award is regarded as the pinnacle of all AAMI awards. Dr. Geddes received the honor in recognition of the importance and unparalleled diversity of his contributions in biomedical engineering. Geddes then used the prize to establish the Geddes-Laufman-Greatbatch Award at Purdue for outstanding research in biomedical engineering by a graduate student or postdoctoral fellow. Since its inception, 33 outstanding students, including Pharris, have received the award. Previous award winners have had successful careers in industry and academia, and remain active with the school in a variety of roles.